CARMENES is a new German-Spanish high-resolution spectrograph operating in both the visible and the infrared wavelength regimes and mounted on the Calar Alto Observatory 3.5m telescope. The main goal of the instrument is it to find Earth-like planets around nearby M-dwarf stars using high-precision stellar radial velocity measurements to reveal the reflex motion of these stars caused by their orbiting planets. The usually used description that a planet circles around its parent star is only half the truth. Since a planet also has mass, both objects are orbiting around their common center of gravity. But the masses of stars are much higher than the masses of planets. Therefore, in the case of orbiting planets, stars have only very slight seesaw motions showing up as tiny periodic shifts (Doppler-shifts) of absorption lines in the stellar spectrum. And CARMENES is the machine to measure those shifts! The CARMENES sample consists of about 300 targets that are monitored in an attempt to find Earth-like planets orbiting these dwarf stars in their habitable zones where the conditions might be favorable for the existence of liquid water and perhaps life. The “habitable zone” corresponds to the distance to a star where temperatures are neither extremely low or extremely high. This ambitious project is a collaboration of 11 institutions in Germany and Spain, which involves approximately 200 engineers and scientists responsible for the optical, mechanical and electronical instrument design and construction, the science preparation program, the observations, the data reduction and the scientific exploitation. As a result of this joint effort and starting in January 2016 CARMENES has collected more than 15,000 high-precision visual and near-infrared radial velocity measurements leading to a significant enhancement of our knowledge about the low-mass stars in our cosmic neighborhood. The first scientific results based on guaranteed time data from the CARMENES survey came from a study led by MPIA and recently published in Trifonov et al. (2017). This study aimed at the analysis of seven known planetary systems around M dwarfs, which had been observed before with the Keck/HIRES and ESO/HARPS spectrographs and were either reported to have one planetary companion or even are multiple planetary systems. These well-studied stars offered an excellent opportunity to test the overall planet detection capabilities of the visual channel of CARMENES and to compare its radial velocity measurement precision with state-of-the-art optical spectrographs such as HIRES and HARPS. Based on the new CARMENES and literature data the likely discoveries of GJ 1148c, and GJ 15Ac are reported, both additional Saturn-mass planets in their respective planetary system. In addition to these two new candidates, almost all of the planets around all the investigated stars are confirmed and their Keplerian orbits and dynamical properties are refined. 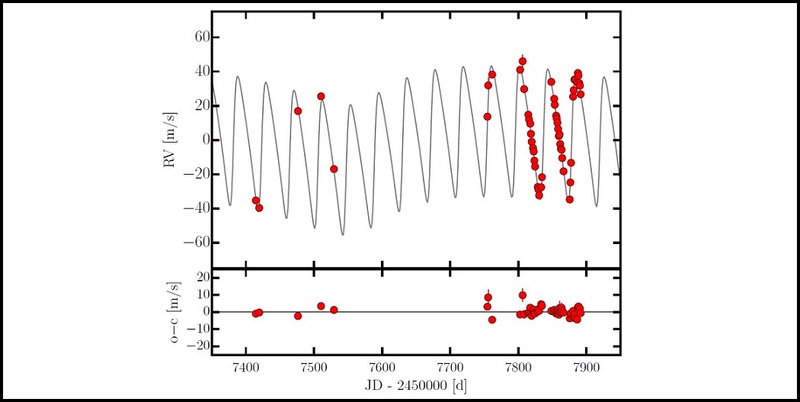 The only exception is GJ 15Ab, for which the study leads to the conclusion that the precise CARMENES data and also the post-discovery HIRES data show no evidence for the existence of the planet, which leaves GJ 15A only with the new planet candidate GJ 15Ac. Overall, the results from this study demonstrate that the CARMENES visual channel achieves a precision comparable to that of HARPS and that it is more precise than HIRES. The authors of the study conclude that the CARMENES visual channel is a state-of-the-art instrument, which is fully capable to discover potentially habitable rocky planets around low-mass stars.